mainly macro: Must we live with a post-truth media? Something odd but familiar was going on when I wrote this post on Labour’s economic record. The Labour leader and shadow chancellor both made speeches that had apparently been months in the making, and which were (I think intentionally) spun as trying to convince voters that they could trust a future Labour government with fiscal management. Why odd? Because it presumes that there is some real problem to solve. It presumes that the last Labour government managed the nation’s fiscal affairs very badly, and so today’s politicians have to show they would be different. Yet the paper I wrote tells a very different story. The previous Labour government set up fiscal rules that were both responsible and better than rules subsequently adopted elsewhere. Until the financial crisis, they kept to those rules. Here is the basic data: the top line is the debt to GDP ratio, the bottom line a scaled up current balance to GDP ratio. Of course it is possible to find fault, and I do. In hindsight it would have been better if the debt to GDP ratio had been kept nearer 30% of GDP, or even reduced further. But debt to GDP was lower before the recession than when Labour took office, and the current balance was almost zero. Hardly a profligate government. Indeed one of the faults I find, over optimism in Treasury forecasts, has been fixed, to the Conservative party’s credit, with the creation of the OBR. With the financial crisis everything changed, because this produced the Great Recession. Deficits go up in recessions. There was a small contribution from the government’s attempt to reduce the impact of the recession, an attempt which analysis suggests was successful, so they should take credit for that. It is pretty obvious that you cannot use the fact that the deficit rose in the recession to argue that Labour cannot be trusted with the public finances. Again, the data speaks - look at when the deficit rose in the past. Of course you could say that the Great Recession was the government’s fault. It should have foreseen the financial crisis coming. It should have known that levels of GDP in 2007 were going to be interpreted, five years later, as a massive economic boom rather than as they appeared at the time as something close to trend. It should have known this, despite the advice it was getting to the contrary from the Bank of England, the IMF, OECD, most economists …. and Her Majesty’s opposition! You can take that idealist view - but not if you were agreeing with all this advice at the time. So the idea that the last Labour government seriously mismanaged the nation’s finances is a myth. What is more, unlike older myths like the earth is flat, as these charts show it is not something that is generated by perception and which requires expertise to unravel. Unless you are completely naive about the impact of recessions on deficits, a quick look at the data tells the true story. So it is a manufactured myth that distorts what the numbers appear to show. The problem with myths is that after a time, even otherwise good journalists at good places like the Financial Times start believing them. Now we all know who manufactured the myth. Yet I think most people believe that if a political party started telling a story that was clearly at variance with the facts, it would be found out. In short, people expect journalists and economic commentators to confront politicians who attempt to create and perpetuate myths. In this case they did not. Its also pretty obvious why they did not. The incentive for organisations like the BBC is to stay out of trouble. And who has been making most noise about bias in economic reporting - the government. As any economist will tell you, its all about incentives. So it really is the duty of academics to speak to truth, as loudly as they can, when it is being ignored by the media. On this topic, the media in general and the BBC in particular have been hopelessly biased in allowing the government to get away with this myth. They have some serious explaining to do. Wasn't it Harold Wilson who said "if you tell a lie often enough it becomes the truth"? And that's just what Cameron and Osborne and supporters did. As soon as they got into office it was taken as gospel, which I thought silly as fundamentally it was a world problem, not a British made one. But who said politics had anything to do with the truth? It's all about power and getting elected - nothing else. and with Iraq hanging around the Labour Party's neck, pretty much nothing they did was going to get them reelected, IMO. I think Harold MacMillan said that his speeches consisted of making the same point over and over, using different words each time. Hitler and Geobbles made the same point. Seems 95% of the human race aren't much better than Pavlov dogs. 'to speak to truth, as loudly as they can'. -this is about the general perception of things (much more difficult to change than wrong factual info). -loud is so 1950's you should use the method that works (so another one, at least if you want it to work, if it mainly is to be nicely irritated on human stupidity, this one works better of course). But the argument about the debt fuelled boom in the private sector, especially one housing driven, is that it generated super-normal tax incomes for the government. It wasn't so much that Brown spent too much but that that spending was reliant on a bubble in tax receipts. All that stamp duty from housing, booming corporate and income tax from banks and bankers' bonuses and from VAt as everyone bought new kitchens and sofas with their multiple credit cards. But didn't many governments, and not just in the UK, believe the economists and financiers when they talked of The Great Moderation? They thought economic cycles were a thing of the past. Wasn't it an economist who said in 2003 that the "central problem of depression-prevention [has] been solved, for all practical purposes"? We know better in hindsight. Stating that they are as 'bad' as the rest of them will not help them in the ballotbox. Voters can make the way back (from deficits to new programms) as well. Main stream parties have already become too similar for the market. One of the main reasons of the rise of the populists. Hardly a message you want to give to your voters: 'it hardly matters for whom you vote'. Furthermore a party should use its energy where it is efficient. Fighting windmills allthough they are real and (unlike for ordinary windmills) dangerous, still makes you look like an idiot. Plus put extra focus on the subject matter (a clear negative (hardly anybody likes extra spending, they like the things that bought it). Doubtful btw if Labour thought that far, the PR machine of political parties is usually simply crap. Probably not is my calculated guess they simply missed it as a priority. Taxes/revenue and gov spending are simply nearly completely obscure for the large majority of voters. Partly very likely caused by things as keeping it away from voters that overall they pay half or more of their income to the state. Partly simply because in a high expenditure enviroment as a welfarestate you simply need all the tax you can come up with to finance things. Spreading taxes gives the opportunity to make them overall higher. In order to get Simon's point through, you will have to explain the basics of government income and expenditure. There might be some reluctance there. Hardly believe that any main stream political party really likes that. Simply what you get for your 50% tax or more doesnot look great. Same as bringing it to the issue of: where scarce means should be allocated. Which is what you are effectively saying from Simon's pov labour allocates means better. As one of those alternatives is leave it with the citizens. System is something happens government act, usually not thinking about costs vs proceeds. And the majority of the voters/taxpayers like that as they havenot got a clue about things like risk assessment and costs vs proceeds. They expect everyday a guy with a bombjacket in their frontgarden (well sort off). And as they miss the link governmentspending means paying more taxes also for them it looks like a great deal. Government is absolutely not focussed on an optimal allocation, it is in an optimal allocation for their voterbase. Which is pretty different. Bring that up big time and you have the next Farange waiting, or better inviting him- or herself for tea. The closer direct democracy is to spending decisions the less the latter take place. Which you will have by getting everything in the general public domain. So Simon will likely simply have to live with this unjustice. With may be as part comfort that a lot of the voterbase of Labour like the idea that Labour is big spending as they think they are not paying it (or at least not equally what they will be receiving) but are benefitting from it. I emailed Mr. Ganesh questioning 2 or 3 of the claims he made in last Saturday's FT article. He hasn't managed to reply yet. @JananGanesh Won't answer he refused to answer my questions on Twitter: all he could say was: who cares about facts they don't matter and then said: I don't want to talk about Patel the Tory economist. 1) What overspending? 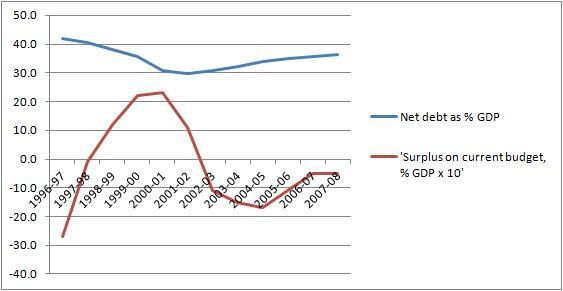 1997 Lab inheritted deficit of 3.9% (not a surplus) cut to 2.1% by 2008 = 50% cut & 22% cut in debt. 2) Who had the biggest ever deficit? 1994 Tory deficit = 7.9% Lab 2010 = 6.7% Who had the highest ever deficit in history? Make sure you click the links within the article for the evidence from the horses mouth. The deficit under Labour in 2009/10 was not 6.7% of GDP, it was 11.2% of GDP. You don't actually define what "mismanagement" or even "serious mismanagement" of an economy is, so we only have your word that it wasn't mismanaged. Surely running a near 2% deficit on current budget whilst at "trend growth" (with plenty of people suggesting this was above trend growth) after 2002 counts as mismanagement, if perhaps not serious mismanagement. And that's before one starts quibbling about areas of spending that were kept off books (transport maintenance counted as capex, tax credits etc). I also echo the question of another poster, which is why doesn't the Labour Party simply produce the data? In theory, the charge of fiscal profligacy shouldn't be hard to rebuff. 1) Who had the biggest ever deficit? 1994 Tory deficit 7.9% 2010 = 6.7% My maths tell me Tories had biggest ever deficit! 2) 1997 Lab inheritted deficit of 3.9% (not surplus) cut to 2.1% by 2008 = 50% cut & 22% cut in debt = biggest ever cut! 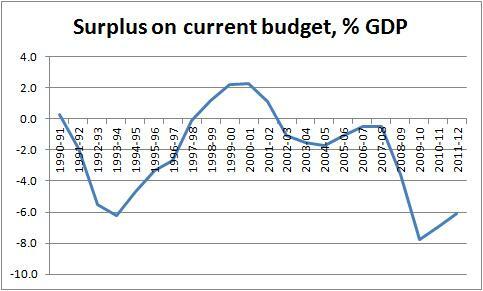 3) Between 1979- 1997 the Tories had deficit through out. David Cameron has lied to the Tories and the whole country. 5)NEWS FLASH! Exposed! Tory MP Lets Cat Out The Bag: Deficit Has Been Cut TRICK!https://twitter.com/TweetBrooks/status/343725655462133762 … SCOOP! 'A lie told often enough becomes the truth' or whatever the exact quotation is was actually Lenin, not Wilson. What about all the PFI expenditure that Labour kept off the books; massively expensive projects up and down the country that were not included in the official figures? And a bit specious to suggest that commentators don't understand that deficits rise in a recession - what is understood is that recession is inevitable, there is no end to boom and bust, and responsible management of the economy would have involved recognising that the enormous tax take was fuelled by financial services bubble, unleashed by the repeal of Glass Steagal in the States, and would have planned accordingly. A classic example of hindsight? Or, like me, are you one of those who always thought neoliberalism would end in tears? Of course, Osborne is now starting another debt fuelled boom via housing. You macro bunch got a geat talent by the way to attack problems in other 'sports' with 'macro-technology'. Like simplifying things to the extreme and assuming everything away that is inconvenient or too difficult to grasp as it is not Macro. I am waiting with anticipation on the post about sending a rocket to Mars and the best way to perform hartsurgery (the laser variety of course). Krugman blog February 5, 2010, 'The Spanish Tragedy' has a great graph showing OECD Government debt as % of GDP for 1997 and 2007, ie when the Labour came into office, and when the Subprime Crisis started (just before the Minsky moment of Lehman). I have a complaint currently going through the BBC Trust on just this topic - hello, Chris Patten (and why is an ex-MP doing this job?). "The job of our economics team is to make sense of hugely complicated areas such as these for general audiences, and for that reason they would often choose not to deploy such difficult jargonistic terms as liquidity trap – especially in a short bulletins piece - if they felt such a term would not add to audience understanding. That in no way is intended to reduce the depth and the context they seek to bring to such issues and I would want to reassure you that they go to great pains to ensure their analysis is as detailed and accessible as it can be...the wider point, of course, is that the Bank of England and Fed in the US would not agree we are in such a trap, even if there are some economists who do" (02 May 2012). The FT source you refer to is hardly objective or unbiased! 1. Brown "we have beaten boom and bust". Why do Labour deserve my sympathy just because the opposition followed his line, along with the finance industry and the entire "house prices go up therefore we're all getting richer" brigade? Don't academic economists seek objective truth rather than party point-scoring? 3...and not just in the black, but with appropriate attention paid to the structural balance allowing for the boom in benefits and in public-sector salaries. Even allowing for Brown's failure (and ours, if you like) to identify the biggest credit bubble in a century, it's a disgrace. 3. "Off-balance sheet financing". Write it 100 times. Tattoo it on your forehead. 4. To comparisons with the recession under the Conservatives, and the size of the deficit at that time: quick question, how quickly did the country recover from that recession? And for how many years were the finances in deficit? 5. To all those of you determined to beat-up market economics, repeat after me: "markets are inanimate institutions; they have no opinions and cannot cause booms and busts; market participants can make errors and can cause booms and busts; Gordon Brown was an enthusiastic participant in the market; governments in general can exercise choice in how to participate in the markets; like all market participants, governments are responsible for the repercussions of their choices". 1. Actually that is what I was trying to do. 2. Which was my whole point: the debt to GDP ratio in 2007 was lower than in 1997. 3a. How public money is spent is not the issue here. 4. We were recovering from the recession until 2010, when policy changed! 5. Hmm, where have I heard something like this before. Ah yes, something about guns not killing people, its the people that use them that are the problem. In 1997, government debt as a percentage of GDP had just peaked after the early 90s recession. The deficit was reducing rapidly and headed towards surplus. In 2007, there had been continuous growth for 15 years and we were nearing the end of a huge credit-fuelled boom which generated enormous tax revenues. Debt as a percentage of GDP, however, had been rising for some time. Only a fool would compare different points in the cycle like this, i.e. the government debt levels after a recession with debt levels prior to a recession. Note that before the early 90s recession (which also followed a credit boom/bust) the government had been running a surplus of around 2% of GDP and government debt was down to 26% of GDP. Had the deterioration in the public finances in 2008 onwards been from a similar starting point, the debt and deficit situation now would have been much much more favourable. And you're an economics professor? Try reading what I wrote. I am critical that, having got debt/GDP down to 30%, it was allowed to rise again. But this is not, for me, some political contest. The issue is whether the fiscal position before the recession was some terrible mess that accounts for much of our current economic difficulties. It is this idea that is laughable. The numbers just do not support this idea. I suggest that you try reading what you wrote. The fiscal position before the recession was, indeed, a mess. Nobody is claiming that it accounts for 'much of our current economic difficulties', but it was a contributory factor because the government was borrowing substantially to fund spending which further drove the boom. The real problem, of course was the credit boom its - government borrowing and spending was only a part of this boom. To run a deficit of nearly 3% of GDP during the greatest credit boom ever, was extremely irresponsible. Had the last Labour government followed similar policies to the Tory government in the late 80s (which also helped create and oversaw a credit boom), it would have been running a surplus of at least 2-3% of GDP an dos the public finances would have been in a fiscal position of at least 5% of GDP better. The deficit would have peaked at around 6% of GDP, not 11%. Brown kept redefining the economic cycle in order to supposedly meet his fiscal targets (he ran a deficit of more than planned every year after 2001). It was obvious that we were storing up problems. I really do not think that you understand numbers. You need to look at trends and understand rates of change. Next you will be writing a piece saying that this government is worse than the last one for fiscal profligacy because it will borrow more than the last one did. One thought for you. If we alternate governments of equal periods and one always doubles the deficit steadily over its term of office and the other always halves it steadily, then both will have run exactly the same average deficit. It would be very easy to tell which was most fiscally responsible, however. This professor definitely doesn't get numbers. The comparison he keeps making between 1997 and 2007 is totally irrelevant - as one of you guys has commented, in 1997 the recovery was well under way and the deficit was falling; in 2007 the boom had been under way for five years. Learned professor, you keep saying you're not in it for the party politics; yet you tell us that we were recovering from the 1990s recession right up until 2010! We might as well say we are still recovering from the South Sea Bubble. Regardless of party politics, the 1990s recovery had a full head of steam by 1997. To put a more technical point to you, learned professor: it's not the overall level of debt or its ratio to GDP that matters (which you keep referring to in your 1997/2007 comparison). It's the direction of travel of that ratio that matters most. In the short run you can accumulate debt, if in the long run your income outgrows it. That's why economists talk about a "primary surplus" while businessmen talk about "debt repayment coverage" and homeowners talk about "mortgage instalment affordability". The fact that debt was growing faster than GDP 2002-2007 was only forgivable if you believed that GDP growth was going to accelerate i.e. that 2-3% was not just sustainable but accelerating. Now that really would have been a crass error. Thank you for clarifying that you don't think "how governments spend money" is an important question for macroeconomists. Gordon Brown certainly agreed, as he sprayed it in the general direction of public sector wages with minimal good effect. I disagree; I think taxpayer resources should be spent in the most efficient way on the most advantageous services possible. This is nonsense, it's not a case of the total amount spent, deficits during a crash, simplistic figures from graphs, and so on - even considering the fact that better govts run surpluses during boom years which Labour did not do. It pertains to the Nu Lab economic model, which was clearly based around fueling private credit booms and then wasting the resulting tax receipts on the usual Labour rubbish - lots of public-sector non-jobs, and thousands of ineffectual public sector "projects" and "services", most of which were or are shite and basically represent a build up of unsustainable enterprise which it takes considerable pain and disquiet to reorder - as per the 1970s. I witnessed the extraordinary public sector corruption and waste of the NU Labour years first hand, and the obviously unsustainable dependencies it created, which are now socially and economically extremely problematic. The author of this blog misses the point about the idiotic nature of the spending - and the next and only left-wing rebuke to this is "oh well the Tories agreed to these spending plans too" - how on earth could a govt in a democracy hope to get elected by advertising the fact that it would spend less during a period when the populace is unaware or unwilling to acknowledge that structural dependencies were being rapidly accumulated? "So the idea that the last Labour government seriously mismanaged the nation’s finances is a myth." Mmmm. Good essay question - a few thousand words plus plenty of real data will sink this. Not much difference between Simon Wren-Lewis' analysis and The Belgrano. Incidentally, economic management includes future commitments and managing economic risk which is, of course, where the wheels really fall off for the argument presented above. Brown and Balls thought they'd found the perpetual tax-generating machine to fund the never-ending (current and future) government commitments. Nice try though. Just a simple - 'we got it wrong' would be nice rather than this sorry revisionist rubbish. Can anybody with a socialist leaning ever apologise for not grasping the fundamentals of economics....? On the other hand, there is the question of whether Labour's spending did any good. Having worked in the public sector throughout the period in question, I would say that although well-intentioned, Labour's expenditure was mis-directed, mis-managed and, in far too many cases, wasted;the amount spent on bureaucratic activity (especially performance management) or vanity projects in the name of regeneration was scandalous and the improvement in public services that was achieved was hugely disappointing. And of course, at the end of Labour's tenure, society was actually less equal, less cohesive and less prosperous. If you judge public spending on how much harm it causes, the case above may be sound; if you judge it on how much good it does Labour has a very serious case to answer. Now we know why you're in academia and not allowed near any real money. I would expect better than this politically driven nonsense from a professor of economics at Oxford. 1. When growth is at trend, a government should not be running a deficit. 2. Even on the Treasury's own figures, the current budget was at 2% deficit. 3. When current spending misclassified as capital expenditure (e.g. repairs and renewals) is correctly classified the deficit was much higher. 4. Growth was not at trend at all, it was the peak of a huge boom. 5. The argument that government did not know this was above trend growth is an argument to reduce government spending. If there is uncertainty then spend less!! It's perverse to see a supposedly qualified economist defend the economic record of Gordon Brown given that he, aided by the BoE, led the UK into a huge crisis with over-loose fiscal and monetary policy. The only possible reason for this article is a political one. Bringing one's political biases to economic analysis is unprofessional and not something I expect from an institution such as the University of Oxford. I'll leave others to judge who is doing the political driving here. That's an easy one Mr Wren-Lewis - it's you. Why else would you claim that "We were recovering from the recession until 2010, when policy changed!" ? As anyone who has actually looked at the figures can see, the supposed recovery was a modest growth in GDP achieved through a huge, and unsustainable, rise in public spending (and borrowing). It isn't hard to manipulate GDP in the short term by this method. Or are you suggesting that under a government of any flavour that the rate of growth in public spending could have been maintained? It's not as if the government actually cut spending after the 2010 election - it just slowed the rate of increase. What these charts show is that Labour ran a persistent budget deficit at the peak of a credit cycle and with c. 14 years "uninterrupted economic growth". This naturally means that there is a large structural budget deficit, there was less fiscal flexibility when a downturn eventually happened, and a larger stock of debt to refinance and to pay interest on. The debt to gdp ratio should have been steadily declining during the Labour Gov't to 2007 because they should have been running budget surpluses with a structurally neutral budget (or with a slight structural surplus). Despite your intentions with this post, it merely confirms Labour's profligate legacy. Read my third paragraph. But there is just no way that allowing the debt to GDP ratio to rise back up in 2007 to a level lower than the one that was inherited, and with a current deficit of 0.5% of GDP, can be described as a profligate legacy. But that contradicts your point that they did not overspend. If Debt:GDP was nearer 30% then they would have, logically, needed to spend less. Therefore, because it was higher they overspent. Where did I say that they did not overspend (or undertax)? "So the idea that the last Labour government seriously mismanaged the nation’s finances is a myth. " Considering a small deficit (as % of GDP in nominal terms) is a large structural budget deficit when cyclically-adjusted, your point that there was no major mismanagement is completely incorrect. Another example: "The previous Labour government set up fiscal rules that were both responsible and better than rules subsequently adopted elsewhere." If the fiscal rules allowed them to have a Debt/GDP ratio close to 40% then they were not responsible. "But debt to GDP was lower before the recession than when Labour took office, and the current balance was almost zero." It should be remembered that the Conservatives had recognised that the debt to GDP levels were very high at that time, and had put in place strict 3 years spending plans to bring them down - plans Labour agreed to stick to (so suggesting they also agreed debt to spending was far too high). Labour, to their credit, did stick to the plans - hence the debt to GDP levels fell to around the 30% levels that you congratulate... but having stuck to the Conservative plans for the 3 years, they then went on a spending spree. The spending spree pushed the debt to GDP levels back towards the level when they took power - the level that was felt to be unsustainable. A reduction in spending was needed just as much as when Labour took over from the Conservatives in 1997 - but it was not apparent that such a drastic reduction was planned. This issue is that we should have been paying back debt during the 2003-2007 boom years, not limiting deficit levels to 30% of GDP. If you cannot pay back debt during the good years then when can you? That was irresponsible. Canada is selling it's fresh water to pay off debt.